Who Cares About the New D7798 Ultrafast SIMDIS Method? Whether you are directly involved in fuel characterizations or not, the new D7798 (D2887 equivalent) method is important to you. If you are directly involved in fuel characterizations, D7798 is vitally important to your industry. This ultrafast method can perform simulated distillation nearly 6 times faster than the previous method (D2887). While many believe that speed of analysis is only about throughput, the kind of speed made possible by D7798 also enables superior repeatability and reproducibility. In turn, tighter control parameters with very high confidence are made possible and practical. And...with improved repeatability and reproducibility, technical staff can spend less time on misleading, analytical variance and more time on true process variance and related product quality analysis. These “secondary” but perhaps more significant benefits of increased analysis speed were demonstrated clearly during the recently completed Interlaboratory Study of D7798. The research report is online at http://www.ASTM.org for members. Conversely only bad things happen with more analysis time. Increased analytical cycles usually translate into more variability and poorer performance, in the analytical measurement and in the process itself. If you are not directly involved in fuel characterizations the global value of the D7798 method may be even more significant to you. Crude oil is a valuable and vital resource in our lives. Crude is refined to create fuels, petrochemicals and further refined chemicals that are processed into many widely used industrial and consumer products. 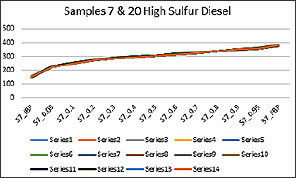 Fuel product quality in particular is defined by the boiling range distribution derived from the D7798 method. More repeatable and reproducible measurements translate into tighter control tolerances. Tighter control tolerances produce better products and reduce costs. Consumption of the valuable and vital resource is reduced. At the bottom line for the refiner, the user and the environment...D7798 means waste not, want not and the world gets a little greener every time the method is applied. The Teledyne-Falcon Series team played an integral role in the development of the D7798 Ultrafast SIMDIS Method and D7798 is employed by the Ultrafast Teledyne-Falcon Series Gas Chromatograph. For more information about the ultrafast D7798 SIMDIS method and the Teledyne-Falcon Series GC, contact the Teledyne-Falcon Series team at GoTML@teledyne.com 1-800-422-1499 http://www.teledyne-ml.com .